Overall, global attitudes toward America are positive. In 28 of 38 nations, half or more of those surveyed express a favorable opinion of the U.S. And across these nations, a median of 63% have a positive view of America. The U.S. receives high ratings in most of Europe, Latin America, the Asia/Pacific region, and Africa. However, evaluations of the U.S. are decidedly negative in most predominantly Muslim nations. And only 40% in China see the U.S. positively. Ratings of the U.S. are particularly high in the Philippines (85% favorable), Ghana (83%), Israel (83%), Senegal (81%), and Kenya (81%). Conversely, fewer than one-in-four view America favorably in Pakistan (11%), Jordan (14%), Egypt (16%), the Palestinian territories (16%), and Turkey (21%). 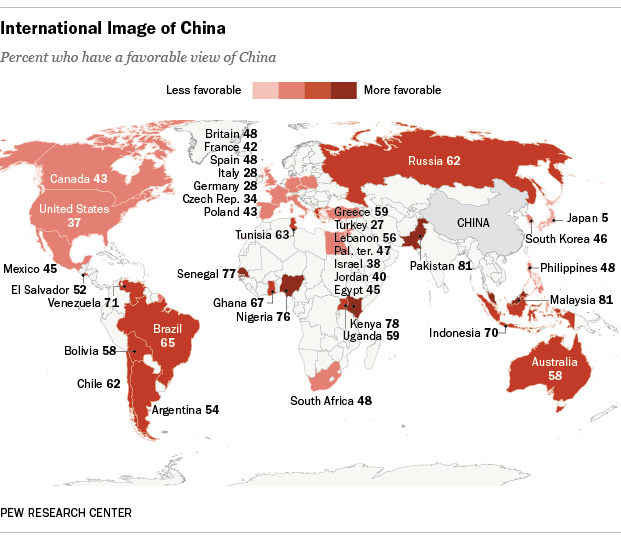 Meanwhile, China is viewed favorably in just 19 of 38 nations. Overall, a median of 50% have a positive view of China. China receives its highest ratings in Africa, Latin America, and predominantly Muslim Asian nations (Pakistan, Malaysia, and Indonesia). However, China is seen less positively in much of Europe, North America, and the Middle East. In the U.S., only 37% have a favorable view. Worldwide, China is seen positively by seven-in-ten or more in Pakistan (81%), Malaysia (81%), Kenya (78%), Senegal (77%), Nigeria (76%), Venezuela (71%), and Indonesia (70%). Conversely, fewer than three-in-ten view China favorably in Japan (5%), Turkey (27%), Germany (28%), and Italy (28%). Who Is Up, Who Is Down: Global Views of China & the U.S.